In the heart of Ireland, in County Clare, you will find the Sunrise Farm Master Unit, also known as Ananda Bharati. This eco-friendly organic farm and bakery, and soon to be healing and meditation center, has attracted many volunteers and visitors to date. Didi Ananda Prama, the caretaker, with the help of many hands, has developed an oasis of beauty and peace conducive to holistic living. Chanting and meditation take place four times a day and sumptuous meals are served to all from the organic gardens teeming with vibrant vegetables, fruits and flowers. 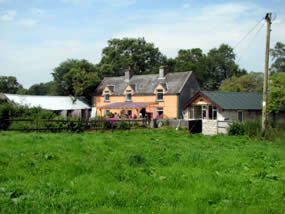 The 40 acre farm, which was bought in 1991, overlooks the Lough Derg, the second longest lake in Ireland, as well as the Slieve Aughty Mountains. At the time of purchase, 10 acres of Sitka Spruce and Pine trees were planted. 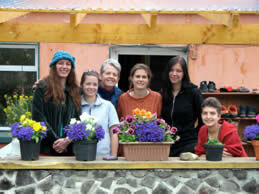 In the Fall of 2004, Didi Ananda Prama began renovations on the house. She fixed up one room and bathroom to start with in the Fall and then came back in March 2005 and started planting a little garden with one volunteer. She also started having working camps with VSI (Volunteers Service International from Dublin), a group that holds work camps to promote peace and understanding. They had three work camps the first summer, the second summer they had 3 camps, the third summer two camps, and this year, the fourth year, two camps. Didi also gets a lot of volunteers from Woofers – Worldwide Opportunities on Organic Farms. With the help of these two groups they fixed up the house and gardens and built a compost toilet, a poly tunnel, a full bakery, and a meditation house. The main house (pictured above) has three bedrooms with bunk beds with capacity of 13. There’s a dining room, kitchen and bathroom inside the house and two bathrooms and a laundry room outside the house as well as an outdoor dining area. There’s also a composting toilet outside the house. 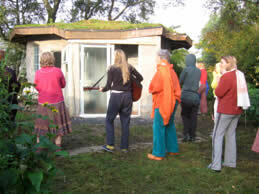 They have just finished a round meditation building room in the back of the house overlooking the river. 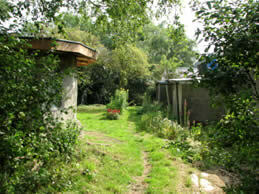 There’s an earth bag dome building on the land that will be turned into a sauna as well as a woodshed and tool shed. Heat in the building is with wood and cooking is with wood and gas. Water is heated with wood. They have a wind turbine which will be installed soon and electric energy will soon be solar and wind powered. There are also plans to put in a biogas plant. They have a septic system and a gray water system that separates their black water and uses a re-bed system to filter the water. In addition they have a well for drinking water. They built a bakery from a converted cow shed – utilizing hemp and lime. It is fully equipped for baking and processing fruits and vegetables. The bakery was built with donations that included the Margaret Mudd legacy as well as door to door soliciting. There’s a barn that they hope to convert into a healing and meditation center and there’s a mobile home and caravan for families and guests. There’s currently about one acre in cultivated horticulture — blueberries, raspberries, black currants, red currants, strawberries, gooseberries, tay berries. There are also now newly planted apple, pear, plum and cherry trees. 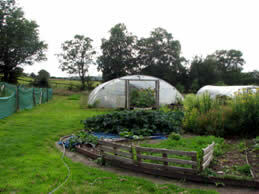 The two polytunnels allow them to grow vegetables all year round. The farm grows a wide variety of vegetables including salad greens, beets, carrots, tomatoes, cucumbers squashes, broccoli, asparagus, cooking herbs, medicinal herbs, etc. Everything is grown organically though not certified as of yet. They sell their produce at the farmers market in Killaloe every Sunday. They also sell food they cook in their bakery kitchen including veggie burgers, falafels, humus, cheesecake, carrot cake, banana cake, chocolate cake, fruit cake, energy balls, cinnamon rolls, blueberry muffins and gluten free sugar free muffins. Most products are vegan and organic. In addition to further development of agriculture, long term plans include developing a retreat and healing center. The farm is part of the East Clare community coop and they work with the Center for Environmental Learning and Training (CELT) as well as the Irish Seed Savers Association (ISSE). 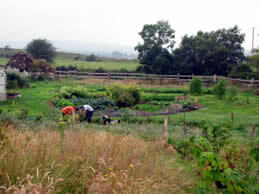 Presently they have many volunteers and people coming to learn meditation, yogic lifestyle and organic farming.